Personally, if I had to choose a portable charger for my phone, I would choose this one. The main advantage of this powerbank is its weight. Several times in my backpack I carried things much heavier, which I could not really use. The weight of such energy banks even does not exceed 100 grams. If you have such equipment in your backpack or purse, you will not even feel it. The device is also small in size. Therefore, without any discomfort, they can be worn for example in trouser pocket or coat. Mobile chargers are also equipped with a display that provides full knowledge of the energy resources of this device. Portable phone chargers brighten your day. 2 600 mAh is just as much as the power of the phone. Power bank provides one full charge for your phone. 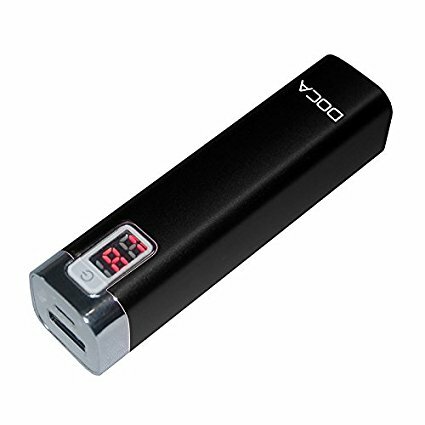 Small dimensions and light weight make it ideal for emergency charging. If you sometimes forget to recharge your phone and often need to contact your friends or clients, the power bank is perfect for you. You do not have to worry now that you do not have a deal. This device was manufactured by DOCA. It is a reputable producer of energy banks, they are cheap powerbanki and at the same time very well made. Energy banks essential device in everyday life. We are worried about our children. Sometimes we hear that they did not ring, because they suddenly exhausted the battery on the phone. Get your child into a decent powerbank. Even if you forget to plug in an electronic charger for your network charger, you will always have a mobile charger on hand. The power bank discussed here is able to store energy for up to 5000 hours. Save your nerves and spare your nerves. Powerbank is the future.